This is a study of the fifteenth-century, “Storie of Asneth,” a late-medieval English translation of a Jewish Hellenistic romance about the Patriarch, Joseph, and his Egyptian wife, Asneth (also spelled Aseneth, Asenath). Belonging to the collection of stories known as The Old Testament Pseudepigrapha and derived from Jewish Midrash, the story was widely read among medieval religious in England in Latin before being translated into the vernacular for devotional purposes. Part of this study considers and identifies the aristocratic female patron (Elizabeth Berkeley) and author (John Walton) of the fifteenth-century Middle English text, based on literary, historical, and manuscript evidence from the sole surviving copy of the text in Huntington Library EL.26.A.13, a manuscript once owned by John Shirley. Also explored is the ritualistic pattern of events in the text (original to its Hellenistic origins) that coincides with ancient female initiation rites as we understand them from recent studies of Greek mythology. Centred in the narrative, culminating Asneth’s liminal seclusion, is her sacred marriage with a heavenly being. The argument suggests that in the Middle Ages this sacred consummation would have been interpreted as the union of God with the soul, similar to the love union in the Song of Songs. In the Christian tradition it is referred to as mystical marriage. Early Christian exegesis supports that Joseph was considered a prefigurement of Christ in the Middle Ages. 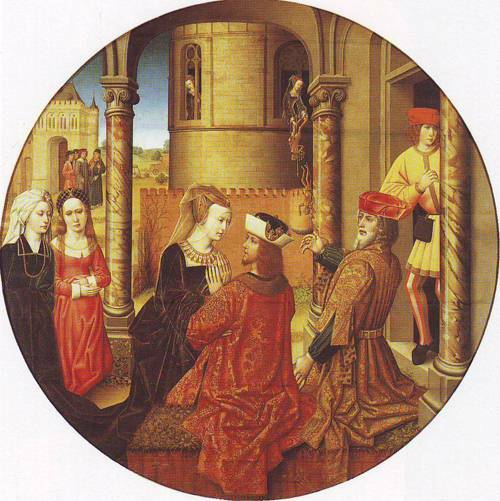 In her role as divine consort and Joseph’s wife, Asneth would also have been identified as a type of Ecclesia in the Middle Ages—the symbolic bride of Christ. Patterns of female initiation in the story are also reflected in the hagiographical accounts of female saints, female mystics, and the ritual consecration of nuns to their orders, especially where they focus on marriage to Christ. The similarity of Asneth with Ecclesia, and therefore Asneth’s identity as a type of the church in the Middle Ages, is then explored in the context of the theology of the twelfth-century Cistercian prophet, Joachim of Fiore. The thirteenth-century Canterbury manuscript, Cambridge Corpus Christi College MS 288 (CCCC MS 288), which holds a Latin copy of Asneth also contains one of the earliest Joachite prophecies in England, known as Fata Monent. The study suggests Asneth may have held theological currency for early followers of Joachim of Fiore in England.